Those (few) of you who have listened to our podcast will be familiar with the ongoing saga of Joe Stickman. Ricky and Adam were at a convention. (Their home away from home.) They were taking some time out from doing their 'thang', and had set to wandering around the place looking to do some shameless self promoting. Strutting about as they were, saying hello and generally trying to look like they were very important people, they eventually stopped at the table of the legendary comic-book artist David Lloyd. Mr. Lloyd, famous for illustrating the epic V for Vendetta (and with notable stints on Hulk, Hellblazer, and the Doctor Who comic series), was there to promote his current venture, Aces Weekly, an online comic featuring a collection of works from David as well as a host of up and coming young artists and writers. They approached Mr. Lloyd to ask if he would be willing to pose with a copy of Copperopolis. 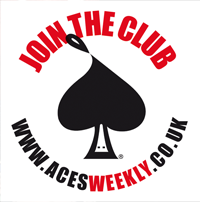 He had one condition; that they subscribe to Aces Weekly; in doing so they would receive a sketch card drawn by David Lloyd and dedicated to one of them. The two writers were more than happy and David Lloyd set about sketching the anti-hero 'V'. David then happily posed with Copperopolis and the boys were back on their way to their desk. Adam, beaming at first took a glimpse at his very own piece of David Lloyd art but was soon looking crestfallen. 'I don't want it now.' Adam declared sadly. Ricky took a quick look at the sketch card and started laughing. Moments in to sketching 'V', David Lloyd asked who would the sketch be made out to. Adam hesitated and said 'Um, I don't know.' David Lloyd, in the noisy hall, misheard this and had dedicated the sketch: 'To Joe.' Adam was crestfallen, which the rest of the group agreed was hilarious(especially Ricky who got a free V sketchcard from it), and used it as a joke from that point forward. Years later Tranter, Kieran and Ricky were attending Nice Con in Bedford, where autographs happened to be free, and the guys thought they would do something nice for Adam who couldn't make it to the con. 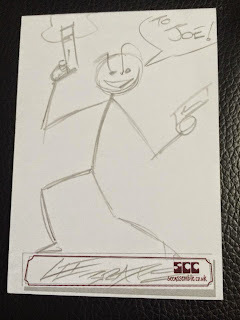 Intending to actually do something considerate for Adam, Ricky took a sketch card with him when getting a sketch from Charlie Adlard to get an autograph for Adam. Whilst in the queue Ricky was struck by a moment of evil genius, and seized the opportunity to further the Joe joke by asking Mr Adlard to draw a stickman and make it out to Joe, and thus Joe Stickman was born. And gave the original Joe a Walking Dead twist. emboldened by this triumph the Guys realised that they were on to something and proceeded to pester other guest such as Barry Kitson. and John Watson, who thought that the joke was very cruel... but contributed any way. When presented with the cards Adam was landed (so much so he has bloody lost them). So with Adam on board the guys realised that they were on to something and decided to make it a convention staple. Here are what they have managed to collect so far. Anthony D. Lee collected at Heroes and Legends Neath. So there you have it! It's great how a simple idea has caught on. No two have been alike. 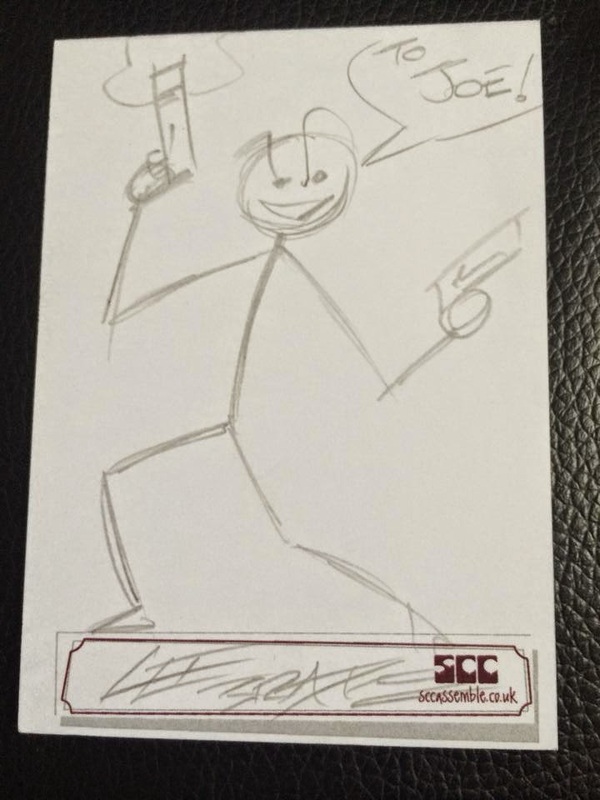 Such has been the response that we've even had submissions from convention attendees eager to get in to the spirit of things and add to our ever-expanding library of Joe Stickman cards. So, if we approach you at a convention, be cool like Adi Granov and Charlie Adlard; give it a go and draw us a Joe!